TubePlay is a media player for playing FLV, MP4, 3GP, 3G2, AVI, VOB, MPEG1, MPEG2, MP3, WAV and other format video or audio files. TubePlay supports zoom 0.5x/1x/2x, full screen, playback progress control, volume control. TubePlay provides file association and drag-and-drop support, so you can double-click or drag and drop any video or audio file to the program to open and play it. You can also use this program to create and manage playlists. ...... file to the program to open and play it. You can also use this program to create and manage playlists. TubePlay can be used standalone, it doesn't require the complicated Flash authoring tool and Flash development tools. 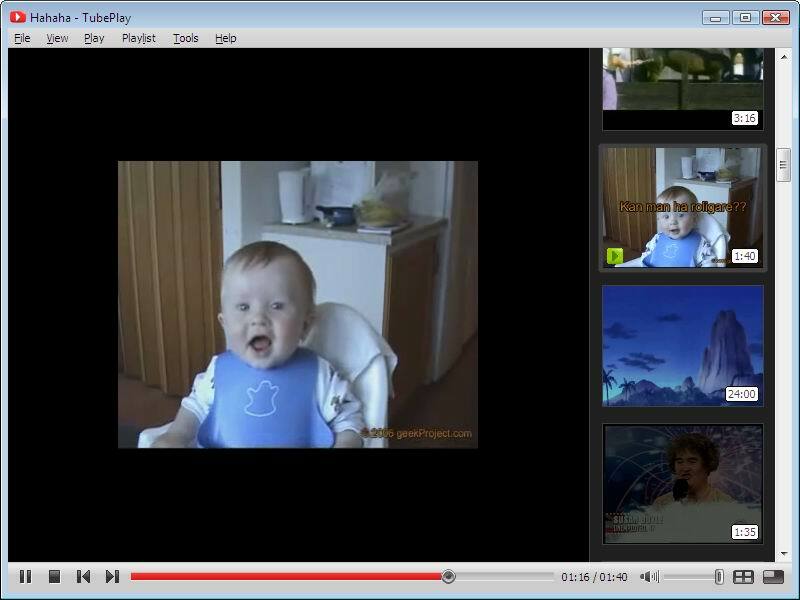 You can show and preview your FLV videos in a more controlled way with ease. * Play FLV, MP4, 3GP, 3G2 and any other format video or audio files. * Zoom 0.5x/1x/2x mode, you can also watch movie in full screen mode. * Thumbnail view, show all playlist items using thumbnail images. * Drag and drop, so you can drag and drop FLV files to the program to play them. * File association, so you can double-click a FLV file to open and play it. * Handy volume commands and mute option. * Always on top to keep an eye on it anytime. Qweas is providing links to TubePlay 2.6.4 as a courtesy, and makes no representations regarding TubePlay or any other applications or any information related thereto. Any questions, complaints or claims regarding this application TubePlay 2.6.4 must be directed to the appropriate software vendor. You may click the publisher link of TubePlay on the top of this page to get more details about the vendor.